Elbow arthritis is a common and often progressive condition in which the cartilage that normally lines the surface of the elbow joint is compromised and eventually worn completely away as a result of injury, overuse, or through inflammatory diseases such as rheumatoid arthritis. While this progressive destruction of the elbow joint may be associated with pain, it also commonly leads to significant stiffness about the elbow. The injury causes the elbow’s normal range of motion to be severely limited, making it difficult for individuals to use their arm to carry out normal daily functions. 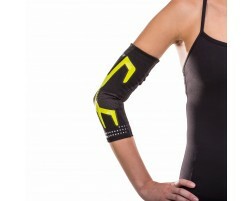 An elbow brace along with cold therapy can help alleviate the symptoms associated with OA. For additional help selecting an OA elbow brace, use our guided tool, Brace Advisor.